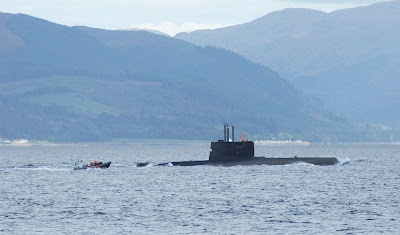 One of the six submarines currently serving with the Royal Norwegian Navy arrived this morning, having taken part in the recent 'Neptune Warrior 072' exercise. This vessel, KNM UREDD, is a diesel-electric submarine, and the result of a joint Norwegian-German project, with hull sections being built in Norway, and assembly being carried out by Thyssen Nordseewerke at Emden, in Germany, in 1990. She is equipped with eight torpedo tubes forward.